The Rite-Neb LP Mini Compressor Nebulizer is compact and lightweight (weighs just 3.2 lbs) with a sturdy handle. It is perfect for portability even for small hands. This nebulizer is powerful and easy to use but economical to operate, using just 65 watts of power. Includes a disposable nebulizer with mouthpiece, "T", 6" reservoir and 7 foot tubing. Maximum compressor range: 36 PSI; Typical Operating Pressure: 11-16 PSI; Typical Operating Flow Rate: 4-8 LPM. 3 year warranty. Easy To Use. Effective. Good Value. Easy To Use. Effective. Good Value. Lightweight. It is lighter weight and quieter than my last one. Good Value. Effective. Lightweight. Easy To Use. Its so easy to use. This nebulizer is so light and handy. Not a bad machine, small..but very hard to find filters for. There is no parts list or contact information on the instructions included. 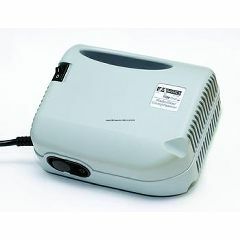 I'm looking for an inexpensive portable/rechargeable compressor nebulizer for travel. Any recommendations? Does the nebulizer come with all the accessories for use such as tube, maske etc? How do you what nebulizer to buy -- just by experience only? How quiet is this compressor? is this and the filters available in my area?...need one 'rite' away.